Plastisol coatings are used to help protect racks from acid exposure and to reduce the amount of chemistry used by not plating the rack. Carlson Erie provides high quality plastisol coatings in a variety of different colors. We will work with you to determine the one option that best fits your needs. 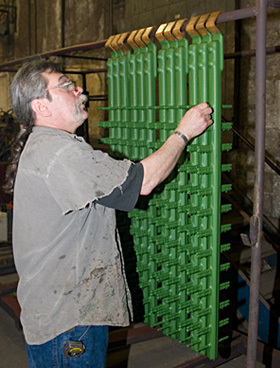 The green plastisol coating tank at Carlson Erie is 7.5 feet deep and 4 feet long to accommodate larger items that might need coated. Electrical bussing can also be coated to help prevent arcing between runs of copper. Whether you need plastisol coating for small hand-held tools or for an entire racking system, Carlson Erie has the experience and knowledge needed to properly assist you. Contact Carlson Erie for a free quote for plastisol coatings today!